Halloween is coming! 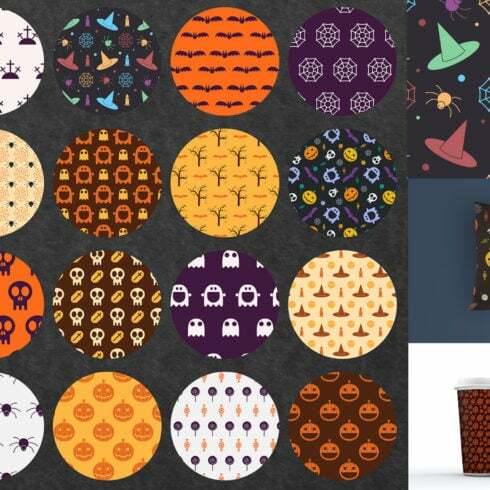 Good time to check this collection of 23 scary and funny halloween patterns. Inside the set of halloween backgrounds you will find halloween pumpkin patterns as well as patterns with skull, ghost, spider, web, candies, bat, witch hat, evil face, tomb and other popular scary halloween symbols. Perfect for halloween greeting cards, textile industry, website backdrops, surface textures, gift wrapping paper, halloween party invitations and far more. You are free to use the products for unlimited commercial purposes! 4 AI CS file with all patterns placed on swatch panel for easy use. 6 EPS CS files with all patterns placed on swatch panel for easy use. 23 PNG and high resolution JPG ( 5000px x 5000px 300 dpi ) files included each pattern. 100 % clean vector. Easy to resize and recolor. Separate AI CS and EPS10 file with 18 halloween objects. Feel free to use them in your projects or make patterns buy your own. 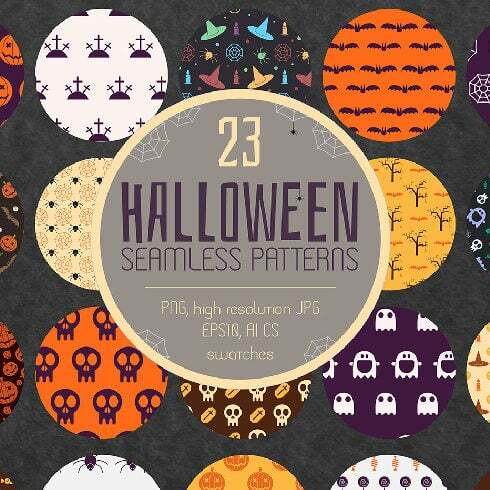 Exactly what is a 23 Halloween Patterns? Every single work of art, no matter if it is a painting, statue or web page design item will have two to three aspects. Other than shapes, size and colors it additionally comes with some characteristics of the surface that is perceived by eye. When viewing the drawing we might say that it’s fine, coarse, soft, smooth, matt, tough or glossy. Now you know what a texture is. 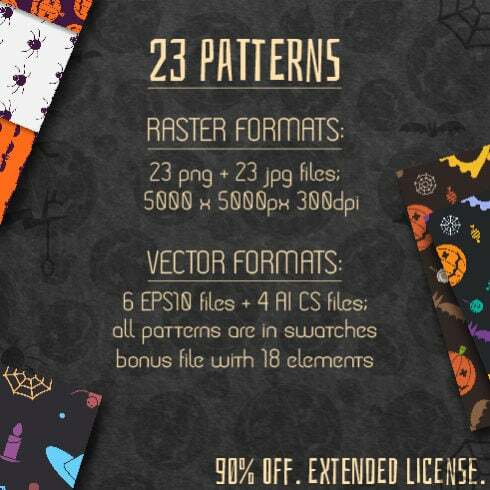 Why on earth do you need a 23 Halloween Patterns? The design pattern can be described as visible arrangement you can see almost everywhere and each and every day. In fact your own dwelling is filled with patterns, for instance, on the wall-paper that dress the wall surfaces of the living room. The pattern is an element of the picture which is predictably repeated on and on to produce a big, geometric and symmetrical picture. Both the textures and patterns are traditionally used in art works. Site designers like to use them given that textures and patterns certainly are a most suitable backdrop for a website – they do not divert the customer but underline the substance of the page. It is too costly to purchase them one at a time, which means that frequently they’re offered in package deals. The Definition Of Bundle Deals? A package is a pack of graphics or some other design items that can be purchased together. The greatest thing about these item packages is their cost. A kit will cost a lot less than each item if purchased separately. Usually, a package will consist of all the things you need to perform a design task. These offers are limited in time, so don’t miss your opportunity to get effective web design solutions and spend less. The reasons why the 23 Halloween Patterns quality is so vital? How to proceed if the product you require is not in the package? It might happen that not every bundle carries items you need and that’s really common. Product bundles are developed for different objectives and for a different style. Even so, MasterBundles.com site has dozens of deals for almost every purpose, so if a given bundle doesn’t include all the solutions you want – you can check the others. There are so many of these, that it’s almost certain you’ll find something appropriate. Can I find any additional packages on MasterBundles? Apart from font bundles, MasterBundles features numerous great deals. Consider web site theme deals, icons, textures, and patterns, graphic bundles. There are as well e-books and courses, stock photography, logo designs, illustrations and add-ons, mockups, and other categories. We have thematic X-mas and Valentine’s deals, post cards and presentations. And also, not surprisingly, our most popular under $5 deals! What is MasterBundles.com? MasterBundles.com project is a huge marketplace, selling bundles of various web products. Anything you might need to develop a design job or a web site is stored here and you could get it for a lower price. There’s also a blog, where you can find relevant information and up-to-date news. The lifetime of a product bundle is quite brief, so to stay in touch and never overlook the deal you need – sign up for a newsletter and receive notifications on all the releases.